The 25.6 metre sailing yacht Evening Star, listed for sale by Kirchner & Mares in Germany, has been sold with Dolphin Yachts in Palma de Mallorca, Spain, introducing the buyer. Built in aluminium by US yard Palmer Johnson to a design by John G Alden, Evening Star was delivered in 1982 as a centerboard ketch and has been regularly upgraded and refitted including a bottom paint job to the hull in 2013. Accommodation is for six guests in three cabins including a master suite with a sauna, while the starboard VIP suite and port twin have to make do with en suite shower facilities. 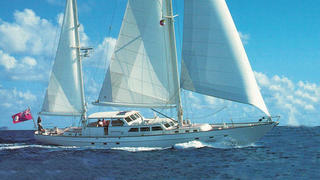 The crew cabin is located in the bow with its own deck entrance and four berths plus a separate captain’s cabin. An interior with teak paneling and brass fittings has a saloon with white L-shaped seating to port facing a Sony flat screen television. The spacious aft cockpit has built in upholstered seating on the transom with two fixed tables, a fridge and an ice maker, making it the ideal area for al fresco evening cocktails and snacks. On the technical side she has hydraulic furling for the mainsail, mizzen mast sail and genoa sail, while deck fittings are by Lewmar and Barient. In addition, her folding propeller is manually adjustable from the cockpit with a winch handle. Her shoal draft centerboard design and Stoway ketch rig allow for great performance and short handed sailing while, under power, a 250hp Volvo Penta diesel engine gives her a cruising speed of 10 knots. Lying in Palma de Mallorca, Spain, Evening Star was asking €590,000.